Nir Keller, the father of Israel Keller, a suspect in the arson-terror-murders of the Dawabsheh family, has penned a toxic Facebook post smearing Reuven Rivlin, Israel’s president, and Pres. Obama as well. The elder Keller’s identity, along with that of his son, is under Shin Bet gag order in Israel. A few days ago, Rivlin won face-time with Pres. Obama as a reward for being the only sane, adult among Israel’s leadership. The two presidents lit Hanukah candles at the White House in a happy, festive winter ritual. A marked departure from the stilted, tense meetings Bibi Netanyahu shares with Obama at the White House. 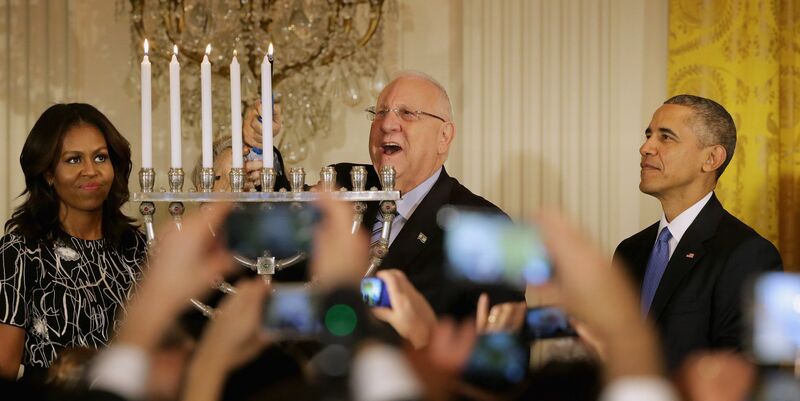 I never saw a kippah on the head of Der Führer Rivlin when he lit candles with “the Arab” in the “Black House.” I’m sure he never said the blessings over the candles either. But even had he donned a kippah and said the blessings, there is no worse example of someone who goes down on bended knee and defiling God’s name in the history of the people of Israel. Rivlin is hated not because he’s a avowed leftist, not because he’s critical of any of the values of the Israeli right. In fact, he’s one of the grey eminences of the Likud. But the farthest of far right hates the center-right Likud represented by Rivlin and others who’ve since been voted out of leadership roles in the party. Rivlin doesn’t even support a two state solution. But his vision of a one-state solution would permit an eventual Arab majority. Something that is anathema to the extreme religious nationalists, who want an Arab-rein State. Nir Keller, surfer dude, Bratslaver, racist: what a combo! Keller is a Bratslaver Hasid, follower of the 19th century Rabbi Nachman of Bratslav. His political views are squarely in the extremist Haredi mainstream. Keep in mind that in Israel hurling charges of being a Nazi are punishable crimes. Rivlin could easily sue Keller if he wished (he doesn’t ). You would think a man whose teenage son is charged with murder might temper his bile. But why should he? He knows the rest of his community and good part of his nation agrees with him. A little digging by an Israeli friend discovered his Google profile featuring him surfing, which he apparently does during winters every year, as there are YouTube videos of his exploits in 2010 and 2011. The photo appears to be a surfer selfie. That phrase sounds better than it looks on the page! Who’d have thought a Bratslaver Hasid could be both a spewing racist and surfer dude?? For those who are wondering, Bratslavers don’t encourage surfing as part of their religious devotion. In fact, Rabbi Nachman, the founder of Bratslav Hasidism, did very little surfing in his Ukrainian shtetl(!) Keller was actually a surfer well before he became a Bratslaver. It appears he may’ve gotten a little too much sun riding the waves all those years! Two of the four currently detained suspects are minors. After the Supreme Court ruled for extending their detention their attorneys argued such treatment ( the suspects are denied consultation with their lawyers as well) was a dangerous development. I would be more impressed if I heard them complain once about such standard treatment for Palestinian security suspects, some of them charged with the “heinous” crime of “inciting” Facebook posts; ones much milder than Nir Keller’s. Not defending Mr. Nir Keller, not at all, but who is immune from being a racist? Why should a Bratislaver not be one? And if he is the father of (as seems suspected) a murderer or arsonist, there is likely to be quite a bit of hate (or dehumanization) going on inside him. They really need to invest in a larger gene pool. There is a great deal of comment in Aust, about this case, as one of the imprisoned suspects is a dual Aust/Israeli citizen. There ought to be a discussion about whether dual citizenship is allowed.